This 1200 square foot 1840’s Creole Cottage is located in the heart of the Marigny Triangle, only 3 blocks from the French Quarter and Bourbon St. and only 1 block to Frenchman St. filled with fantastic music clubs (jazz and others) and great restaurants. The kitchen has new stainless steel appliances including 5 burner gas stove, refrigerator with ice maker, dishwasher, microwave, toaster, coffee maker, etc.. The kitchen is fully stocked with all your culinary needs during your vacation whether you are just looking to make a quick breakfast or if you are serving dinner for eight! Behind the kitchen is a full 4 pc bathroom (including tub and shower) with a beautiful reclaimed organ base custom made into the vanity, features slate tiles in bathtub and tumbled marble tile flooring. Through the living room’s exposed pocket doors you will enter the second bedroom. This bedroom features an antique art deco styled armoire, QUEEN sized bed w linens, 32” flat screen TV w cable TV and iPod docking clock radio. Either through the doorway of the second bedroom or entering off the kitchen is the master bedroom and bathroom. Master bedroom features a QUEEN sized iron sleigh bed with linens and full double closet to hang clothes and tuck away your luggage! A 32” flat panel TV and an iPod dock/clock radio to enjoy. The master bathroom is a full 4 piece including full bathtub and shower, featuring marble tile in the bathtub and slate tile floor. In the Master Bath is a washer and dryer that you can use as well. Upstairs in the loft is a daybed (with pull up trundle) that will sleep 2 people, and a lovely second floor deck, bask in the warm New Orleans sun or enjoy the evening stars and a cool beverage ! Owner Note: Our base price includes 3 sleeping areas that can accommodate 6 people - if the loft is up steps so if you would rather you can use the pull out sofa as an option for sleeping, if you wish to use both the loft and sofa please note there is an additional surcharge for the housekeeping staff's added time for extra laundry etc. Please inquire with owner for added info. House features 11 foot high ceilings, heart pine wood floors in living areas and tile floor bathrooms, lots of windows with tons of natural lighting, and lovingly refinished with an eclectic combination of new and salvaged materials gives this cottage a very comfortable feel. The home is great for families and groups of all lifestyles. The neighborhood is friendly and accommodating to all, host to many local bars and restaurants for all tastes and styles. Marigny, in the opinion of many, has become the more bohemian extension of the French Quarter, increasingly becoming the neighborhood of choice for writers, painters, musicians, street entertainers and artists of all sorts. The home is non-smoking, but smoking is permitted outside on the front stoop. Sorry at this time, we ask for no pets. MINIMUM AGE to rent home is 25 years old and a copy of photo ID is requested with rental confirmation. We have wanted a second home in New Orleans for years , we feel that this neighbourhood is the perfect location, central to everything you need or could possibly want to do, and the peacefulness of a safe residential neighborhood. We extend our home to you because it is too great a spot to not share! It's fantastic location! 1 block to Frenchman street which has the best music and food to be found in New Orleans and a 10 minute walk to the French Quarter. Tons of amazing restaurants and shops within the surrounding blocks. Safe and friendly residential neighborhood, that is welcoming to everyone! We love the Marigny Bywater area for it's creative and energetic vibe! Lots of artists, musicians, writers and painters. This 1840's cottage is full of history and charm AND has all the right updates! 12 foot ceilings and lots of windows make it bright and inviting. The great floor plan gives privacy to the sleeping quarters yet an open floor plan in the living areas, making it a cozy and welcoming home! A few novels by local authors and a variety that past guests have left for others to enjoy. Walking distance to many attractions, clean, comfortable, safe neighbourhood. Highly recommend!! We stayed at the Bohemian Bungalow for a ladies Mardi Gras getaway. The house had everything we needed and was within walking distance to all the action. Liz was very helpful and provided us with tons of info for our stay. We visited many of the suggested bars and restaurants and they did not disappoint. Great memories for another bucket list trip!! M the French Quarter as well as Jazz on Frenchmen St. The wine shop two doors down was a great place to end the night, especially on Friday nights! Breakfast at Ruby Slippers was a block away! The house had everything we needed. It was clean and comfortable! Beds were comfy, bathrooms were well equipped. The kitchen had everything we could need! I would absolutely come back to this place! Very comfortable spot for 2 couples close to Frenchman and the Quarter, very walkable everywhere! Loved the place and will stay again. 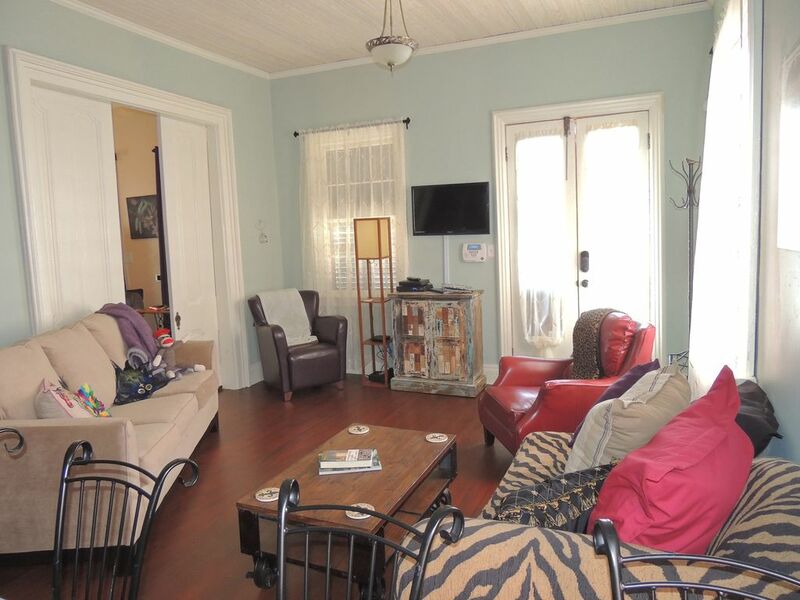 Great traditional NOLA house refurbished w great showers, bathrooms, good beds and furniture. Nicely outfitted kitchen, tho we didn't cook being in this neighborhood with so much at hand. Wonderful location. My friends and I (five adults) had a wonderful stay in this bungalow. It is situated in a perfect location, in a neighbourhood right near the French Quarter. Throughout our stay, we enjoyed the local bar and the wine bar located nearby. Contrary to other reviews, we did not have any problems with noise from the street. The place was very clean, and we loved the interesting furnishing, the full kitchen, the living room, and the rooftop patio. Our host, Liz, was extremely friendly and helpful in our correspondence. Would definitely recommend and would stay here again! Beautiful house , convenient location! Thanks so much - come stay with us again anytime! We are only 1 block to Frenchman Street! The most famous and frequently visited section of Frenchmen Street is a short section in the Marigny neighborhood, just down river from the French Quarter. This area was once the plantation of a wealthy Creole born man who made the dice game Craps popular in America. He influenced the city of New Orleans with his joie de vivre–or a keen enjoyment of living– and extravagance. In 1806 his property was subdivided. The area of Frenchman Street in the Marigny neighborhood slowly developed into a happening block with a mix of a unique European flair and cosmopolitan feel. Now, Frenchmen Street is the thriving epicenter of New Orleans music, culture, and food. The street’s eclectic mix of people, clubs, restaurants, and venues come together like a gumbo to form one of the most energetic and vibrant cultural hot spots in the entire world. Come to Frenchmen Street to immerse yourself with the locals, and have an experience of New Orleans that you will never forget!